I deserve a standing ovation for staying awake through 75 minutes of this fluff. I listen to a lot of classical music, and not since Maurice Ravel’s Daphne et Chloe has something dissipated so quickly before reaching my brain. Granted, that was ballet music, which is meant to be incidental, part of the mise en scene (5 points for working that into a sentence) behind the principal players. With nothing else to look at, Standing Stone is a standing bore. The four primary movements are broken into pieces, which are themselves modular in design, creating an endless corridor that leads to nothing. A theme nearly emerges in the choral sections, a sympathetic wilting over something, but it’s unlikely the subjects of this symphonic poem (early Celtic man) were akin to anything so genteel. Listen to Richard Strauss’ Also Sprach Zarathustra, and its intensity is truly primal. 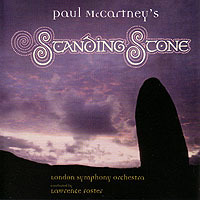 Listen to Standing Stone, and you hear a lot of Celtic neanderthals prancing around like valets on a Parisian holiday. The potential for a Paul McCartney classical album is not inconsiderable, but the man who gave us “Eleanor Rigby” has trouble rigging the sail this time, leaving the London Symphony Orchestra to luff in the wind. I know the polite thing to do is curtsey once, note Sir Paul’s past accomplishments, and greet his new dalliance with modest curiosity. Call it the emperor’s new opus, the little kid in me wants to say that Standing Stone is constructed as well as a Czechoslovakian auto. (My apologies to Czechoslovakian automakers for the analogy.) However, however, however... somewhere in the third movement, Standing Stone got a hold of me. Not enough to wash away all the bad feelings, but enough to suggest that listeners who skip ahead to the third movement might make it through this with their sanity intact. The last half of the third movement in particular benefits from strong arrangements, and the emotional swelling at the end is the sort of Wings on Strings that many may be seeking from Stone. As long as it is, few listeners will still be standing when it’s all over, but if the mere mention of McCartney sets your heart atitter, then nothing I can say will stop you.